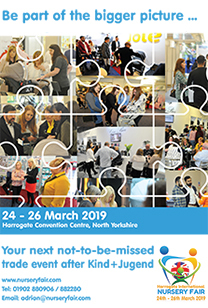 The doors to Harrogate Nursery Fair closed on a hugely positive note last week with both exhibitors and visitors reporting an excellent show all round. 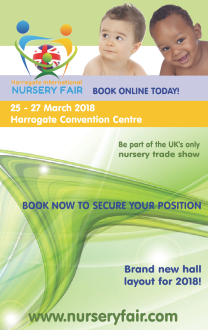 Held at the Harrogate International Centre for the 42nd consecutive year, Harrogate remains the UK’s favourite nursery trade show for both exhibitors and visitors with a record number attending the event this year. Many exhibitors commented on the professional, yet friendly approach of the organising team which offers a high level of support, particularly to new exhibitors ensuring a relatively stress free exhibiting experience. Also, apart from the obvious business networking opportunities, another major attraction is the beautiful North Yorkshire location and the chance to experience the historic sights of Harrogate. “Almost all of the exhibitors we have spoken to have reported a successful show, but exhibitors in Hall Q appeared particularly pleased with the quality of visitors, with Claire Mitchell of Chillipeeps announcing her delight at orders taken during the event; and Daniel Kobryner from Kiddy advising that despite booking quite late and having some reservations on their location they had an excellent show; it goes to prove that no matter what the position, if your customers know you are there, they cannot help but find you such is the way the fair is laid out. Kiddy will definitely be re-booking a stand next year. “We were also pleasantly surprised by the level of take up for the Baby and Nursery Trade Awards (BANTA) and from the positive comments received believe they added real value to the show. It also added an element of Kudos to the Harrogate Nursery Fair Party night which not only sold out, but had a waiting list of people desperate to attend. There was certainly a very sociable atmosphere this year and we are delighted that so many exhibitors and visitors were able to join us for drinks and snacks at the Majestic on Monday evening – the dance floor was literally packed and a great time had by all.